I am often asked about ways of repairing clothing. Chances are if you sew others have asked you as well. Here is a fast method that I use, most often for repairing jeans. First I trim back wild threads. I use a coat of Frey check on the hole or rip. This product seals the fabric and helps give it body to receive stitches later. I try and match the color of the garment with the patch fabric. Iron on some interfacing to the back side of your patch fabric. The interfacing will be touching the skin on the inside of the garment so keep that in mind when choosing your interfacing option. 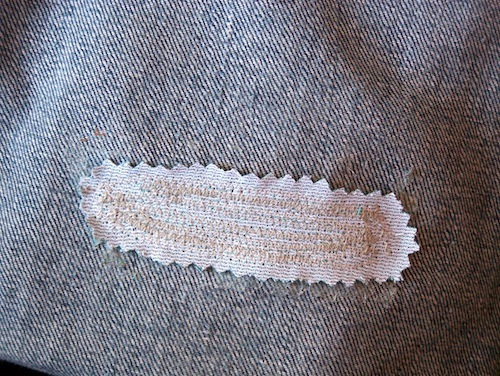 I then place the prepared patch on the underneath side of the tear. 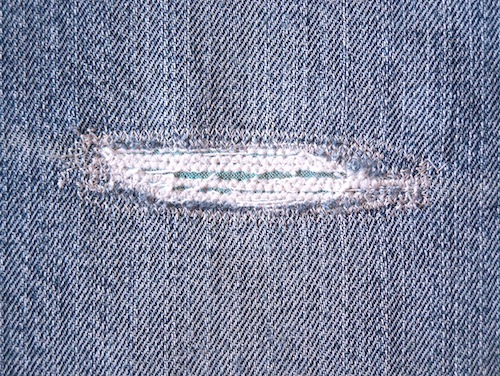 I first lay a basting stitch around the circumference of the repair. The next step is really trying to mesh the old fabric with the new. A series of back and forth zig zag movements can really lay down shreds and threads. I used my pinking shears to trim back the patch to prevent bulk and fraying on the inside. The hole will be seen, secure and not going to rip or tear more. The best advice I can give on repairing jeans is do it now. The more often a tear is washed and worn the larger it will become. A fun contrast or decorative patch can also be a great way to repair. Tackling the repair pile can be a great motivator in starting and finishing other sewing projects. Just In: knits, organic cottons, books and more!